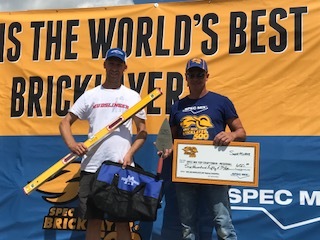 Norman, OK – The 2018 SPEC MIX BRICKLAYER 500® Oklahoma Regional Series has come to a close and mason Darian Douthit and mason tender Andy Zepeda of Providence Masonry, Fairland, OK won it all. Now they head to Las Vegas to compete in the SPEC MIX BRICKLAYER 500 World Championship next January at the World of Concrete. Brown Machinery hosted the regional series event, one of 24 being held across North America. The qualifying national competitors will battle for a chance to win over $125,000 in cash and prizes, including a Ford F250 XLT 4X4 truck and John Deere Gator. Douthit is no stranger to the national competition. He is a former SPEC MIX TOP CRAFTSMAN winner and is aiming to head back to Vegas to win it all this year. 10 teams of highly skilled bricklayers battled for a spot on the national championship roster. Their mission was to build a wall as big as they could in one hour. The mason with the most brick laid with the least mistakes wins. Mason Darian Douthit and mason tender Andy Zepeda celebrated victory with a brick count of 548. 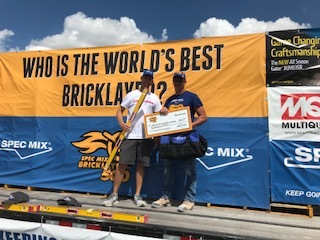 For their efforts they win the title “Oklahoma’s Best Bricklayer,” $650, and will head to Las Vegas to compete in the World Championship. 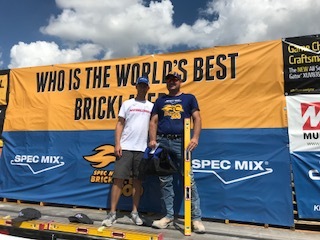 Douthit also took the title SPEC MIX TOP CRAFTSMAN, which goes to the mason with the “most sellable wall.” That honor earned him an extra $500. 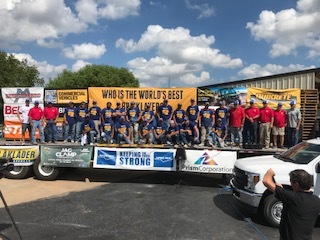 2nd place went to mason Jeremy Lamb and his mason tender Luis Martinez of CIA Masonry in Pauls Valley, OK with a brick count of 472 earning them and cash prize of $375. Third place went to mason Kallan Dawson and his mason tender Wesley Wood of Lonestar Industries in Lubbock, TX, with a brick count of 299, earning them a cash prize of $300. Special thanks to Meridian Tech for coming out and helping the SPEC MIX Mudslingers push tubs of mortar throughout the course. It was a warm day in Oklahoma, but the competition was a success.